WARNING: The photo below is graphic depicting the results of a severe head injury – swelling and a black eye. On September 29th 2009 Joseph William Baker would find himself struck with police batons 15 times and his head stomped on three times. This wasn’t the end of it. The Hospital would deny Joseph water after crying out for water 35 times with the head nurse saying “well if you hadn’t knocked over an officer..” indicating that she was inflicting punishment without judicial oversight. There are codes of conduct agreed to in the Geneva conventions that require prisoners to be cared for and specifically they are to be given access to water. This was the beginning of the torture Joseph was to endure. Joseph was invited to Ms. Giery Boyd’s apartment in this telephone call. Ms. Boyd and Joseph had met earlier that evening singing karaoke in Oildale, California. The plan was to arrive at her apartment at 3:00 am in the morning to spend the rest of the night together spooning. Bakersfield Officer Patrick Lefler initiated a false arrest accompanied by officer Richard S. Davis, Jr. False because Lefler told me I was going too slow and then in the police report said I was going too fast. It was a dark alleyway with some lighting and I felt I was going at a safe speed as I was looking for the address. The police report falsely indicated I didn’t have a valid license. Both Wisconsin plates on the car and Wisconsin drivers license were in order and valid. 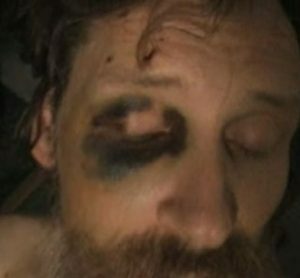 Joseph Baker’s injuries about three or four days after being battered with 15 strikes of a baton and being stomped on the head three times.